My latest Vinyl Anachronist column is now online at Perfect Sound Forever. This one's about the "$500 rule" concerning analog. Enjoy! One day last week, I suddenly had a hankering for a new CD from First Impression Music (FIM). I've purchased three or four of Winston Ma's discs over the last year or so--usually while I'm exhibiting at trade shows and I need something cool and different to play for the show attendees--and the sound quality is always phenomenal. I look at some of these audiophile discs I've been listening to lately--Blu-ray audio from 2L Recordings, CD/SACD hybrids from Analogue Productions and these hi-rez redbook CDs from FIM--and I realize I've been listening to these more than I've been listening to vinyl. So I wanted more. I went straight to the First Impression Music website and found that nearly everything was available online, including a few titles I thought were no longer available. 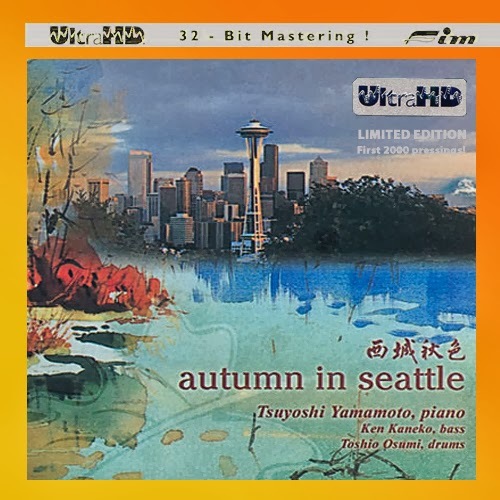 I placed an order for Tsuyushi Yamamoto's Autumn in Seattle on UltraHD and within four days the disc was in my mailbox! Not bad. I could easily make a habit of ordering, I don't know, one per month this way. These discs just sound so wonderful--I've never heard the upper frequencies of a digitally-reproduced recording sound so pleasing and effortless. So I picked Autumn in Seattle because it's Tsuyushi Yamamoto, and my Three Blind Mice LP of his Midnight Sugar is the best-sounding jazz recording I own--maybe even the very best-sounding recording I own, period. (For the record, the Tsuyushi Yamamoto Trio's Misty is also pretty spectacular, and I own that on LP as well.) On the other hand, I checked out the tracks and this is a collection of standards--and not the type of standards I really enjoy. We're talking "The Way We Were," "Raindrops Keep Falling on My Head" and "Love Is a Many Splendored Thing," which all have the potential to sound incredibly cheesy in this day and age. Then again, the idea of Yamamoto-san doing an album of Bacharach sounds mighty cool as well. Truth is, the results are better than I had imagined. I did have to grit my teeth a little during the more fanciful parts of "Raindrops," but the rest of this album's full of strong, solid jazz performances that just sound gorgeous. 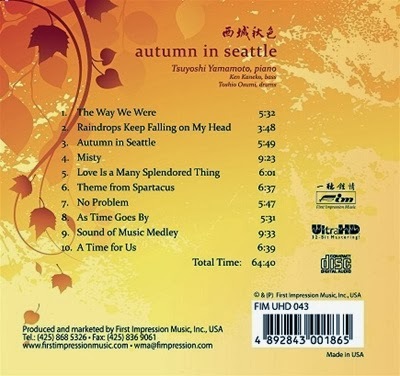 I do think Midnight Sugar is a much stronger recording, which is strange because Autumn in Seattle is a far more modern recording--originally recorded and released in 2001, it was remastered and reissued in FIM's UltraHD format in 2011. On the other hand, the fact that Midnight Sugar and Misty originally came out in the mid-'70s might also explain why it's the better recording, especially according to us analog troglodytes. But that certainly doesn't mean that Autumn in Seattle doesn't sound absolutely stupendous--because it does--those two older albums are just that special. I'm kind of hooked now. It was so easy to order through the website, and I think shipping may have been free--or at least really cheap. The CD was $41, and a little over $43 was charged to my credit card. I think $41 may be the top of the line--there's plenty of selection in the $20 to $35 range. By the way, I listed to this CD with a great pair of mini-monitors, the MAD 1920S. I've been listening to so many BIG speakers every since we moved to Colorado because we have such a big room now. We have so many quality mini-monitors such as the MADs, the Trenner & Friedl ARTs, even a pair of Rega RS1s that I've only used a couple of times. Over the next few weeks I'll be "getting back to my roots" and listening through mini-monitors. It's no secret that Jeff Joseph has discovered how to get a small speaker to sound like a really big speaker. Have you heard the Joseph Audio Pulsar? Have you ever heard a two-way bookshelf speaker do this nice of an impression of a floorstanding three-way tower before? Neither have I. 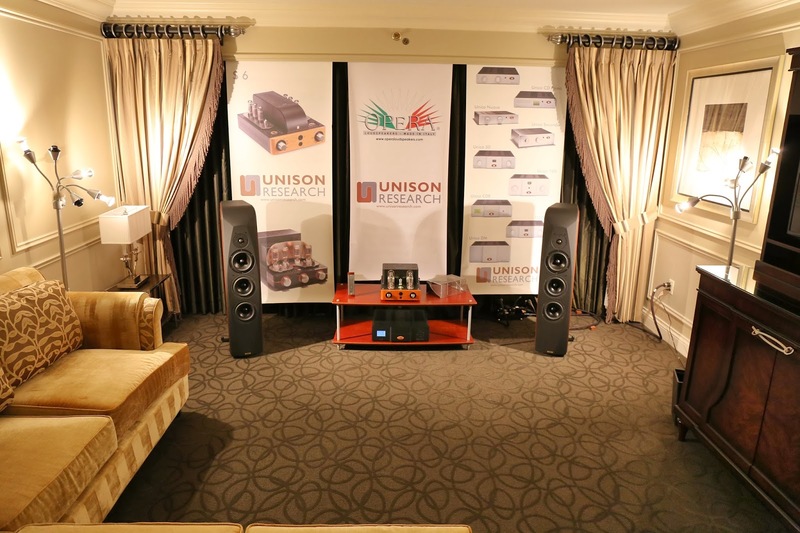 Back at the New York Audio Show last spring, CCI lent a Unison Research Unico 50 integrated amplifier to the Joseph Audio/Channel D room. I walked in toward the end of the show and listened to a few demo cuts from Jeff--who has an absolutely encyclopedic knowledge of good music--and it was simply a breathtaking system with an expansive sound that broke down the physical dimensions of the room. 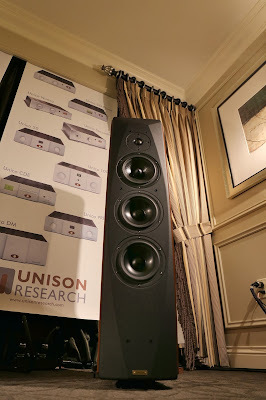 The Pulsars are expensive--$7700 per pair--but after a minute of listening you'll understand why. There are only a couple of two-way stand-mounted monitors that I enjoy more than the Pulsars; one is from Magico and costs $27K/pair and the other is from TAD and costs $37K/pair. I like the Pulsars a lot. That's why I made a couple of special trips to the Joseph Audio room during CES--because I wanted to hear the Pulsars in action. I was surprised, however, to learn that Jeff was debuting two new speakers at CES--the $3700 Prism and the $7000 Profile. These new models don't look quite as opulent as his premium line (Pulsar, Perspective and Pearl3), but they have clean yet subtle angles that are very attractive. Just as I approached a system that featured the small, stand-mounted Prism, someone told me--either Jeff or dealer Shayne Tenace--that the deep bass and huge soundstage of the Prism was going to remind me of the Pulsar. It did. While it's become an audiophile cliche to talk about mini-monitors that "defy physics" by creating extraordinary amounts of bass, the Prism could be the next bellwether for this type of thinking--all for a price slightly less than half the cost of the Pulsar. And while I suspect the Pulsar outdoes its little brother in terms of sheer size, it was almost shocking to hear the Prism create deep, tuneful bass that could instantly put a big smile on my face. Of course the main event was centered around the Joseph Audio flagship, the Pearl3. 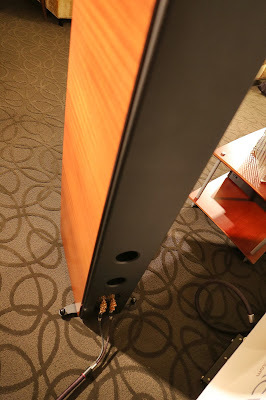 The system was quite extraordinary--big Bel Canto Black monoblocks and other electronics, a Brinkmann turntable and arm (thanks, Colleen, for telling Andrea Brinkmann that she reminds me of my first wife), the Soundsmith Hyperion cartridge and Cardas Audio Clear cables. I'm shaking my head slowly because I wish I had spent more time in that room, listening to LPs on a completely mind-blowing audio system. Did I say "adventures"? To tell you the truth, it was a fairly quiet CES for Colleen Cardas Imports. My theory is that CES keeps getting larger and larger--as in number of square feet someone has to cover to see it all--yet attendance seems about the same. That makes it appear much quieter than it really was--everyone is too spread out. I said the same thing about the Rocky Mountain Audio Fest last October. These shows keep getting bigger and bigger, but the same number of people keep showing up year after year. It's not necessarily a bad thing. CES can be such a stressful show because it's a trade show that's not open to the public and everyone is there to do business. The 2014 CES, therefore, was mellow compared to years past. But I wouldn't mind seeing a little more excitement next year, when they start holding CES on the weekends once more. That's been one of the criticisms of CES during the last couple of years--they switched the show to mid-week and a lot of people can't get away from their day jobs. Oh yeah...there was some bad weather that may have affected the 2014 CES. That "polar vortex" wound up delaying something like 18,000 flights the day before the show started, so a lot of exhibitors had to work through the night to get ready for day 1. Despite all this, Colleen and I were very pleased with the way our system turned out. We debuted two new products in the Unison Research/Opera Loudspeakers/Furutech room: the new Unison Research Triode 25 amplifier ($3495) and the new Opera Quinta SE loudspeakers ($6995/pair). Our digital source was the Unison Research Unico CD player and all the cables and power management was by Furutech. It was another simple system that only took a couple of hours to set up correctly. Once we had everything hooked up and playing music, we were quite proud of the results. For about $15K without cables, the overall sound was quite amazing. I know--I'm expected to say that. I'm a company man. But I love the way this system played tunes. The Quinta SEs go very deep in the bass, and although the Triode 25 only has 22wpc in triode mode, the bass filled the fairly large room with ease. I had the pleasure of breaking the system in for a couple of weeks prior to the show, and it was the system I installed back at home after we returned. The Quinta SEs, which were serial number 001, have already been sold but I get to listen to them for another month or so. These speakers make me have happy feelings. So what is the Opera Quinta SE? First, its arrival was a bit of a surprise--we had no idea Opera was working on this model. It's basically an Opera Quinta--for all intents and purposes it looks the same--but it sports a new SEAS midrange/bass driver that's formed out of woven polypropylene. It looks a lot like a carbon fiber cone but it sounds smoother. The Quinta SE, as you can see in this photo of the back panel, is ported. The regular Quinta has a sealed enclosure. The standard Quinta can reach down to 30 Hz, so the SE version may dig down and retrieve another couple of Hertz. After hearing deep bass on familiar recordings that I've never heard before, I'd say that spec is just about right. 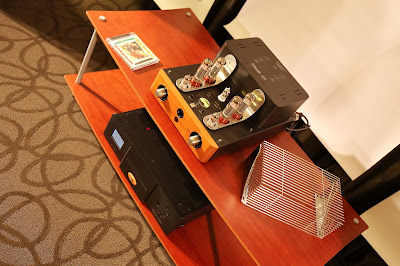 The Unison Triode 25 integrated amplifier was also an unexpected treat. Unlike most Unison Research tube amps, which are mostly single-eneded parallel Class A designs, the Triode 25 is a push-pull Class AB design that can switch from triode (22epc) to pentode (45wpc) with a flick of the switch. First of all, I wound up leaving the 25 in triode mode for most of the show because it sounded so darned good that way. (Pentode mode allowed more extension at the frequency extremes, but it flattened out soundstage depth a little.) That said, the Triode 25 comes close to the sound of the S6--my personal favorite in the Unison Research line-up--for almost $2000 less. I really love this little amp and I'm planning on holding onto it for a while more as well. Once again I have to make the excuse that I was stuck in my room for the entire show, so I didn't get out and listen to a lot of other gear. 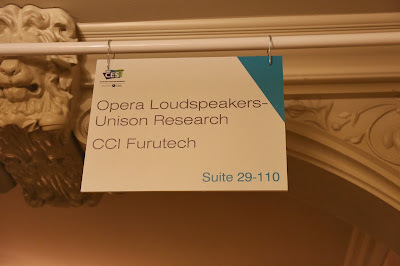 (I did venture into the Joseph Audio room a couple of times, which I'll report in the next blog entry.) But I did visit the T.H.E. Show at the Flamingo to check on another one of our brands--My Audio Design from the UK. Timothy Jung, founder and designer for MAD, was showing his gorgeous Grand MM monitor speakers ($8200/pair without stands) in a system that included Burmester and SOTA, and he was getting a powerful, authoritative sound out of his fairly large stand-mounted monitors. At one point Timothy really cranked up the volume on the system and my head started to spin, but the MMs didn't fail to reproduce the accurate sound levels of a live rock performance. I'm just getting old. Last year I reported on one of my pet peeves at trade shows--fear of sitting in the "sweet spot" chair in order to appear polite. 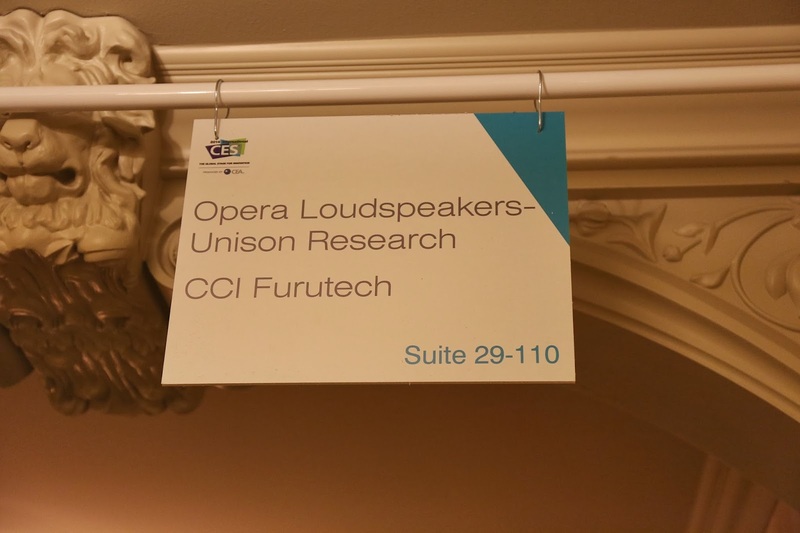 At this CES I found something new to grumble about. Here's the scenario: a person walks into the room saddled with all sorts of photographic equipment--tripods, cameras, maybe even an assistant. They snap a few quick photographs and then quickly exit a room. Okay, that's not so strange considering all of the international press that covers CES. But at this CES, it happened every few minutes all day long for the entire show. None of these people asked questions about the equipment they were shooting. They didn't stop for a second to listen to the music. These people were on a mission--to photograph EVERYTHING at CES. Ordinarily this wouldn't bother me, but I'm seeing a trend on audio discussion forums. Someone will mention a particular trade show, and then someone else will say, "Hey, let me post some of my pics from the rooms at the show!" Then that person posts page after page of photos of all the gear. On one forum I saw a guy post forty-eight pages of photos. Of course the other posters would ask questions like "Wow, those Magico speakers look amazing! How did they sound?" Unfortunately, the shutterbug doesn't have a clue and made some sort of lame excuse for not offering an opinion on the sound quality. This person doesn't remember because this person wasn't listening. To all the shutterbugs, I must say that you're doing it wrong. Sure this gear is beautiful and it deserves to be photographed. But your hi-rez digital photography only scratches the surface. Set your camera down for a minute and listen for a change. You'll have more fun. This is just a test. Ugh. The photo above is of my listening room today, January 27, 2014. I've just put the tiny My Audio Design 1920S monitors in the big system, and they're a great match with the new Unison Research Triode 25 integrated amplifier. It's the first time I've been able to post a pic on my blog in 2014. Evidently the only way to rejoin the world of the blogging is to start using Mozilla Firefox as a browser from now on. Now I have nothing against Firefox and I've had it installed on my computer for years, but I've been using Internet Exploder forever and haven't felt compelled to make the switch on a permanent basis. I'm not one of those computer people who are constantly looking for bigger and better software programs. I just want stuff to work and I want to use it indefinitely when I like it--or get used to it. I'm not afraid of change; I just need a good reason to change. Everyone's been telling me to use Mozilla forever, and now I have to. I can't post photos on this blog without switching to Mozilla. It's pissed me off because I haven't been able to blog for most of this month, and I have things to say and records to review. But I will catch up in the next few days. I haven't blogged in a couple of weeks because there's a glitch on Blogger that is preventing me from posting photos. After following all of Google's troubleshooting recommendations, I still haven't resolved the issue. Today I checked on the Google Help Forum and it seems everyone is having a similar issue. Google is working on this, so hopefully I'll be able to resume blogging! Thanks for your patience.